A Frequency Dictionary of Russian is an invaluable tool for all learners of Russian, providing a list of the 5,000 most frequently used words in the language and the 300 most frequent multiword constructions. The dictionary is based on data from a 150-million-word internet corpus taken from more than 75,000 webpages and covering a range of text types from news and journalistic articles, research papers, administrative texts and fiction. All entries in the rank frequency list feature the English equivalent, a sample sentence with English translation, a part of speech indication, indication of stress for polysyllabic words and information on inflection for irregular forms. The dictionary also contains twenty-six thematically organised and frequency-ranked lists of words on a variety of topics, such as food and drink, travel, and sports and leisure. 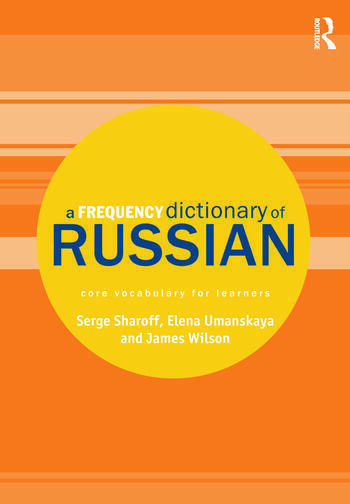 A Frequency Dictionary of Russian enables students of all levels to get the most out of their study of vocabulary in an engaging and efficient way. It is also a rich resource for language teaching, research, curriculum design, and materials development. A CD version is available to purchase separately. Designed for use by corpus and computational linguists it provides the full text in a format that researchers can process and turn into suitable lists for their own research purposes.